(Left to Right) English professor Pearlie-Mae Peters, sophomore sociology major Marcquis Smallwood, sophomore psychology major Legend Hicks, junior psychology major Celeste Forrester attended the Multicultural Studies Program’s guest speaker series, featuring English professor Mickey Hess’ (far right) new book. 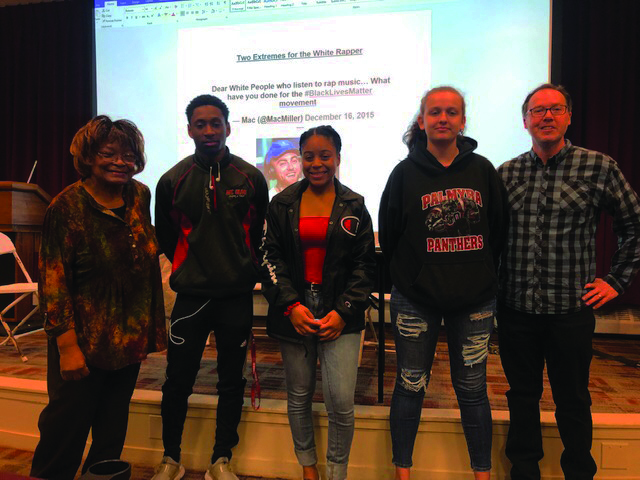 Students expressed several concerns in the days since the controversial Rider Turning Point USA event, “White Privilege is a Myth,” which occurred on April 2. Responding to this unease, Mikey Hess, an English professor, was featured in the Multicultural Studies Program’s guest speaker series to discuss his new book, “A Guest in the House of Hip-Hop: How Rap Music Taught a Kid from Kentucky What a White Ally Should Be,” on April 12. In his new book, Hess explained how hip-hop shaped his world view as a child. He also discussed what it meant to be a proper “guest in the house of hip-hop” as a white listener. During his discussion, Hess said that, while America has made lots of progress toward racial equality, there are still many social injustices present in today’s society. The Civil Rights Act is only 55-years-old, meaning many of the grandparents of college students today surpass it in age. Hess said he strives to guide white listeners of hip-hop into mindsets of respect for hip-hop’s culture and the ability to identify the ways they have unknowingly benefitted from racial oppression. He also explained why the rapper Lord Jamar describes white rappers as “guests in the house of hip-hop.” Hess explained that white rappers were not part of the countless decades of racial oppression that hip-hop was birthed from. Hess was, by no means, against white people making hip-hop music, but he claimed that it was imperative for them to understand the ways they were benefitting from black culture. Hess called upon several examples of white rappers to assist him in demonstrating this point. He used Mac Miller as a model of how white rappers and listeners should act, as Miller understood his place in hip-hop and supported the need to respect rap as a product of black culture. The rapper Tom MacDonald and his song “Whiteboy” was used to demonstrate the other end of the spectrum. Hess explained that, in this song, MacDonald showed ignorance to the social constructions that have historically favored the white majority. Hess picked apart the lyrics of this song and explained to the audience why MacDonald’s thought process was illogical. MacDonald claimed that, since he never had a slave or physically enacted racism, that he was disassociated with those who have done so in the past. Hess explained that the social imbalance of races is the product of decades of disenfranchisement which still infringe upon the black community today. Freshman film, TV and radio major Sarah Waldron agreed that white privilege exists. “I truly see what goes on in the world around me. It hurts me to watch this happen to my friends of other races,” Waldron said. According to Hess, MacDonald cannot disassociate from this because it is an unchangeable aspect of American history. Hess states that it is MacDonald’s duty, along with all white fans of hip-hop, to identify the ways in which they have inadvertently benefited from years of racism. Much more about this topic can be read, in further detail, in Hess’ book, which was given away in a raffle at the end of the discussion. “I don’t particularly like directly selling my books to students, which is why I am raffling away my newest book and two copies of “The Dirty Version” to the three lucky students,” he said. However, for those who are interested in purchasing the book, it is available at various online retailers.